Carpet beetles can cause serious damage to products of animal origin such as wool, fur, hair and feathers. Most common products are fabrics which may be found with holes from both carpet beetles and their larvae. Carpet beetles are oval and range from black and black with yellow/white scales. They can cause serious damage to products such as fabrics and furniture that is made of wool, fur, hair or feathers. Adult carpet beetles are easy to identify by their shape and colour. The body is oval to almost circular (2.8 mm to 5 mm long) and the colours range from all black to black with a pattern of yellow and white scales on the head and wings. The larvae of carpet beetles have may visible hairs along their body and may vary from pale to dark in colour depending on the species. Carpet beetles can cause damage. Products such as fabrics exhibit various holes from the adult and irregular holes in material from the larvae. Furs and brushes may have tips of hairs damaged, leaving uneven areas. The female black carpet beetle lays her eggs near or on a food source. If no food source can be found, the female will lay them in dark undisturbed locations where the larvae can feed on carpeting or clothing. It usually takes 177 to 370 days for a larva to emerge into an adult. The adult lives for 30 to 60 days. 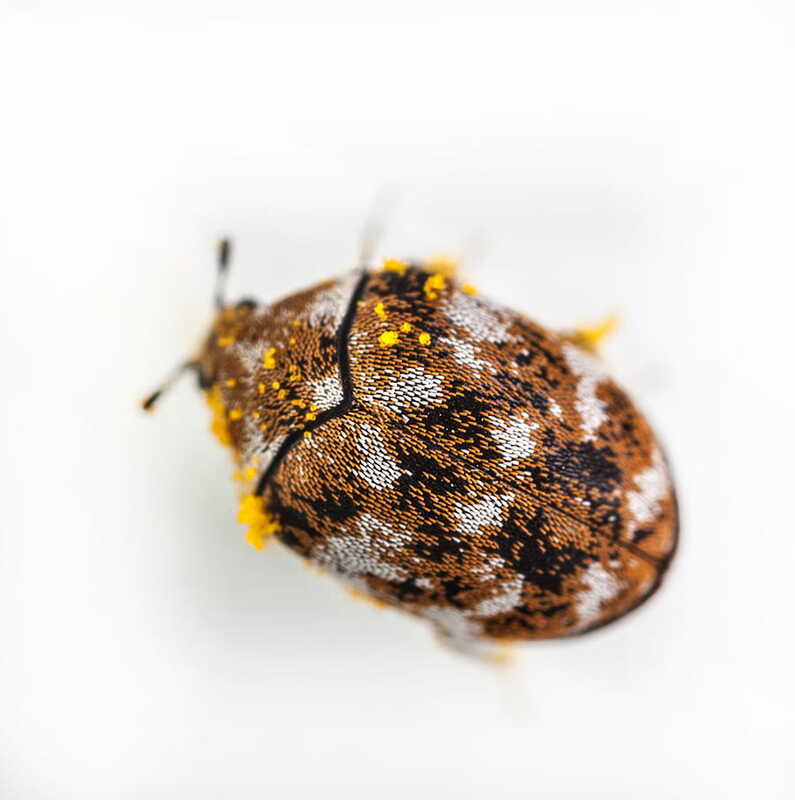 The female varied carpet beetle does not always lay her eggs on larval food material. It usually takes 222 to 323 days for a larva to reach adulthood. The adult male lives 13 days whereas the females live 14 to 44 days. How do l recognize a carpet beetle? Adult carpet beetles are easy to identify by their shape and colour. The body is oval to almost circular (2.8mm to 5mm long) and the colours range from all black to black with a pattern of yellow and white scales on the head and wings. The larvae of carpet beetles have may visible hairs along their body and may vary from pale to dark in colour depending on the species. Are carpet beetle dangerous to humans? 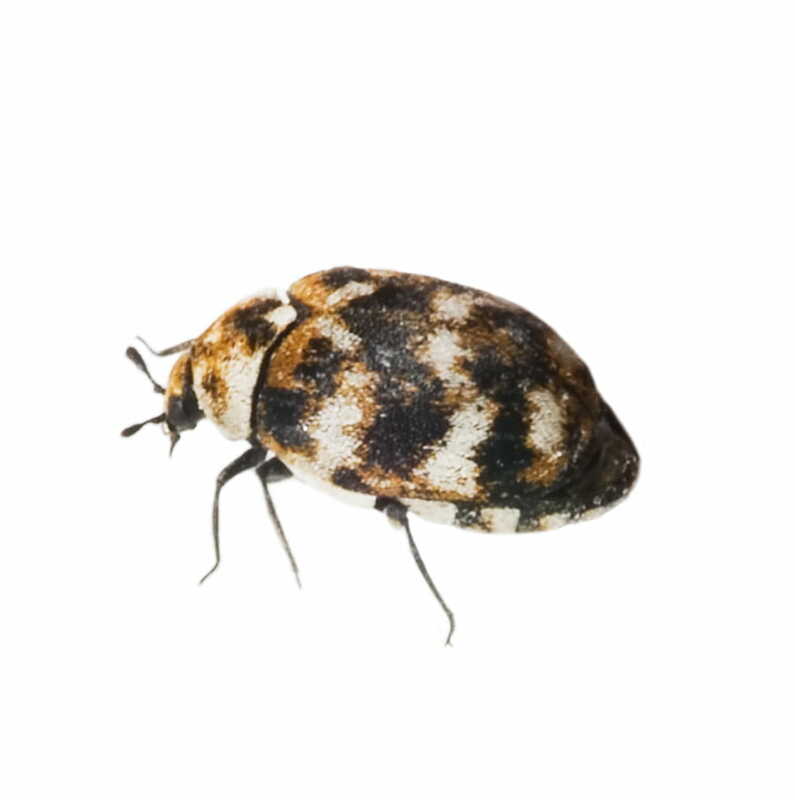 Where do you find carpet beetle? If I have an infestation of carpet beetle, what can be done to eliminate them? Once you locate where the carpet beetles are breeding in your property, vacuum the area thoroughly. Sprinkle boric acid on your carpet and vacuum it up after two or three hours to kill the carpet beetles and their eggs. Machine wash clothing, towels, bedding, cushion covers and curtains. 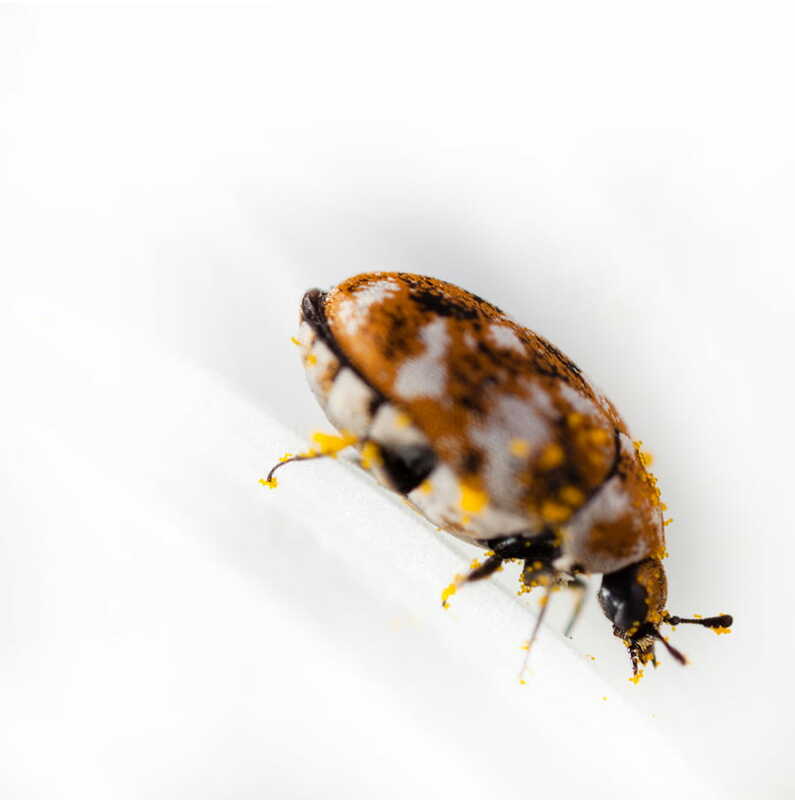 If you continue to deal with carpet beetle infestations, it may be time to call in the experts at Abell Pest Control.